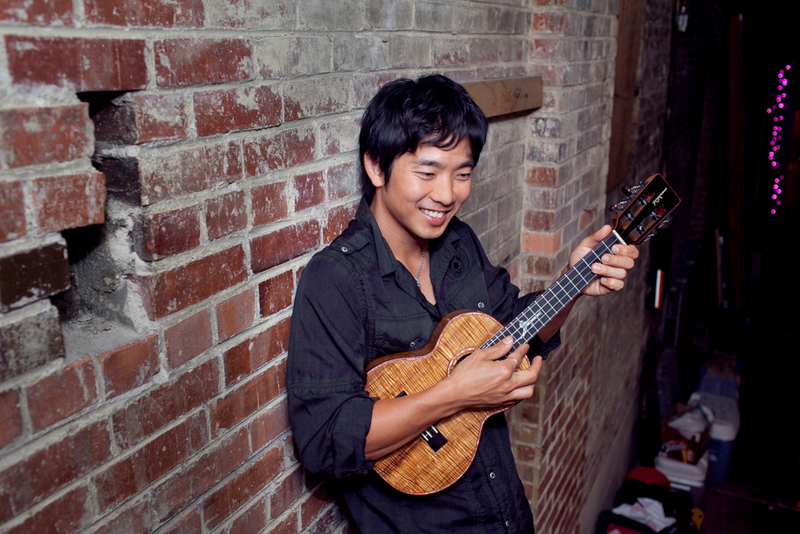 The word “virtuoso” is not usually preceded by “ukulele,” but that’s always been Jake Shimabukuro’s advantage. “Which is great,” he added, with a laugh. Shimabukuro delivered an exceptional performance on April 24 at a sold-out Bing Concert Hall, his first time back on The Farm in ten years. He mostly played originals but included some of the covers that introduced him to a popular audience. When Shimabukuro was introduced by Stephen Sano M.A. ’91 DMA ’94, director of choral studies at Stanford and a friend and mentor to Shimabukuro, he was praised for his love of the instrument, of music, his energy, and his intellect. Sano described the sessions Shimabukuro had held with students before the concert, and complimented him on his thoughtfulness and the way in which he approached making and playing music. Shimabukuro’s performances ranged in style and energy. For some pieces, he channeled his inner rock-star, jumping and bouncing around the carpeted stage. For others, he stood, fixated, evoking so much more emotion than one could imagine possible from such a simple instrument. The simplicity of the instrument and his fast finger-work created an effect that was as unlikely as it was moving. He played a number of intricate, complex melodies, typified by his rendition of Queen’s “Bohemian Rhapsody,” which he famously played in a 2010 TED performance, as well as his cover of The Beatles’ “While My Guitar Gently Weeps”. Shimabukuro’s dynamism, sincerity and versatility were all on show last week, and it was truly something to see him go from one song to the other, the first bursting with enthusiasm and the second invoking a somber melancholy. He sometimes enlisted the help of a bassist, Rich Glass, to add another dimension to his performance. For one song, he even used effect pedals to transform the ukulele into an electric guitar. For another, he used the pedals to record and loop a song to great effect. On several occasions, Shimabukuro stopped to speak to the audience about his background and his instrument. He said that he fell in love with the ukulele at an early age – he first got his hands on the instrument at age four, and he hasn’t let go since. “You’d have to pry it out of my hands for me to eat dinner and do my homework,” he joked to the audience. He described the inspiration behind many of his most famous works, often moments shared with family and friends. “Blue Roses Falling” was inspired by stories told to him by the ill grandmother of a friend of his, who saw hallucinations of blue rose petals falling at night above her as she lay on a hospital bed. Another song, “Gentle Mandolin,” which he dedicated to his son, was inspired by his love of the mandolin and its special chord voicing. He joked that he had to really stretch his fingers to do the piece justice, but he managed just fine. Shimabukuro gushed about the venue, speaking multiple times mid-performance to thank the Bing family for having made it all possible. Speaking directly to Helen Bing, who was in attendance, he thanked her, saying that, “we’d be looking at the stars if it weren’t for her”. He dedicated his encore to Mrs. Bing, playing a beautiful rendition of “Somewhere Over The Rainbow” from “The Wizard of Oz”. That was also the only song Shimabukuro played acoustically, on a ukulele that was specially commissioned by Sano. It was made with the leftover cedar from the construction of the Bing Concert Hall stage. His own ukulele was made by Kamaka Ukulele, a premier Hawaiian ukulele manufacturer (and a favorite of Shimabukuro and George Harrison). Shimabukuro also described his relative good fortune for his ability to play the instrument professionally, and internationally. Contact Aaron Sekhri at asekhri “at” stanford.edu.